Lumbosacral nerve root anomalies are the leading cause of lumbar surgery failures. Although co-occurrence of lumbar spondylolysis and disc herniation is common, it is very rare to observe that a nerve root anomaly accompanies these lesions. A 49-year-old male patient presented with sudden-onset right leg pain. Examinations revealed L5/S1 lumbar spondylolysis and disc herniation. At preoperative period, he was also diagnosed with lumbosacral root anomaly. Following discectomy and root decompression, stabilization was performed. The complaints of the patient diagnosed with lumbosacral root anomaly at intraoperative period were improved at postoperative period. It should be remembered that in patients with lumbar disc herniation and spondylolysis, lumbar root anomalies may coexist when clinical and neurological picture is severe. Preoperative and perioperative assessments should be made meticulously to prevent neurological injury. Combination of L5-S1 spondylolysis and adherent nerve root anomaly has been only rarely reported in the literature. In this paper, we aimed to discuss clinical, radiological signs and surgical therapy in a patient with a rare combination of lumbar disc herniation and spondylolysis with lumbosacral nerve root anomaly. This is a case report of a 49-year-old male with lumbosacral root anomaly accompanying L5/S1 lumbosacral spondylolysis and disc herniation. All clinical, radiological, and surgical signs were evaluated. Previous literature was reviewed and main findings were compared with literature data. Our patient had occasional low back pain for 5 years and severe right leg pain for 1 week. He presented with sensory and motor symptoms originating from L5 and S1 nerve roots. Bilateral and dynamic lumbosacral X-rays and three-dimensional computed tomography (CT) showed bilateral pars interarticularis defect and spondylolysis of L5, and MRI demonstrated L5/S1 disc herniation with right paramedian foraminal extension [Figure 1] and [Figure 2]. Neurological examination was remarkable for hypoesthesia on a region corresponding to L5 and S1 dermatome, and loss of strength in extensor hallucis longus and tibialis anterior muscles. Therefore, a surgical intervention was decided. L5 spinolaminar process was totally removed using the line of bilateral pars interarticularis, and L5/S1 posterior instrumentation was performed. It was observed that S1 root ascended above normal at right L5/S1 disc space. Whether the appearance thicker than normal is a disc or root anomaly is not differentiated; it was noted that S1 root ascended with L5 root as a tense and single root when pushed medially [Figure 3]. 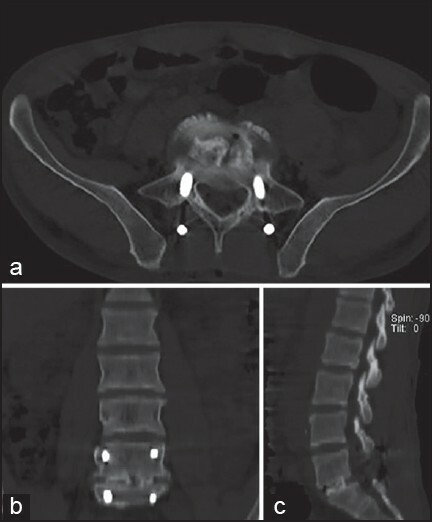 Lateral portion of the facet was partly removed and foraminotomy was performed followed by completion of bilateral L5/S1 discectomy and performance of posterior lumbar interbody fusion with spinolaminar process in the resulting space [Figure 4]. The visual analog scale of the patient, which was nine at the preoperative period, regressed to one. The patient mobilized at postoperative day 1 later and discharged at postoperative day 2. During the review of the preoperative MRI of the patient, it was noted that the root traversing the right L5/S1 level had a greater transverse diameter than that of the left root on axial cross-sections [Figure 2]. Pamir et al. in an article published in 1992, reported that laminectomy, facetectomy, and pediculectomy are required, and a standard surgical procedure does not suffice to complete adequate decompression in such patients. In another report it was suggested that routine microdiscectomy would not suffice and foraminal decompression would be needed in the presence of root anomaly combined with disc herniation,  As White et al. have reported, it is obvious that morbidity rate will increase due to excessive traction of neural components when an additional facetectomy is not performed,  Taghipour et al. operated all of 22 patients with root anomaly with additional laminectomy, medial facetectomy and pediculectomy. Patients with lumbar spondylolysis and disc hernia with more severe clinical and neurological signs than expected should prompt physicians to consider coexisting lumbosacral root anomalies. In such circumstances, the diagnosis should be established with MRI and meticulous preoperative assessments should be made when planning surgery. At perioperative period, the possibility of presence of a root anomaly should always be kept in mind to avoid neurological injuries. 1. Postacchini F, Urso S, Ferro L. Lumbosacral nerve-root anomalies. J Bone Joint Surg Am 1982;64:721-9. 2. Prestar FJ. Anomalies and malformations of lumbar spinal nerve roots. Minim Invasive Neurosurg 1996;39:133-7. 3. Böttcher J, Petrovitch A, Sörös P, Malich A, Hussein S, Kaiser WA. Conjoined lumbosacral nerve roots: Current aspects of diagnosis. Eur Spine J 2004;13:147-51. 4. Chotigavanich C, Sawangnatra S. Anomalies of the lumbosacral nerve roots. An anatomic investigation. Clin Orthop Relat Res 1992;278:46-50. 5. Haijiao W, Koti M, Smith FW, Wardlaw D. Diagnosis of lumbosacral nerve root anomalies by magnetic resonance imaging. J Spinal Disord 2001;14:143-9. 6. Peyster RG, Teplick JG, Haskin ME. Computed tomography of lumbosacral conjoined nerve root anomalies. Potential cause of false-positive reading for herniated nucleus pulposus. Spine (Phila Pa 1976) 1985;10:331-7. 7. Scuderi GJ, Vaccaro AR, Brusovanik GV, Kwon BK, Berta SC. Conjoined lumbar nerve roots: A frequently underappreciated congenital abnormality. J Spinal Disord Tech 2004;17:86-93. 8. White JG 3 rd],[ Strait TA, Binkley JR, Hunter SE. Surgical treatment of 63 cases of conjoined nerve roots. J Neurosurg 1982;56:114-7. 9. Cannon BW, Hunter SE, Picaza JA. Nerve-rootanomalies in lumbar-disc surgery. J Neurosurg 1962;19:208-14. 10. Rask MR. Anomalous lumbosacral nerve roots associated with spondylolisthesis. Surg Neurol 1977;8:139-40. 11. Neidre A, MacNab I. Anomalies of the lumbosacral nerve roots. Review of 16 cases and classification. Spine (Phila Pa 1976) 1983;8:294-9. 12. Pamir MN, Ozek MM, Ozer AF, Keles GE, Erzen C. Surgical considerations in patients with lumbar spinal root anomalies. Paraplegia 1992;30:370-5. 13. Davidson D, Rowan R, Reilly C. Lumbosacral nerve root anomaly associated with spondylolisthesis in an adolescent: A case report and review of the literature. Spine (Phila Pa 1976). 2006 1;31:E718-21. 14. Lotan R, Al-Rashdi A, Yee A, Finkelstein J. Clinical features of conjoined lumbosacral nerve roots versus lumbar intervertebral disc herniations. Eur Spine J 2010;19:1094-8. 15. Kadish LJ, Simmons EH. Anomalies of the lumbosacral nerve roots. An anatomical investigation and myelographic study. J Bone Joint Surg Br 1984;66:411-6. 16. Artico M, Carloia S, Piacentini M, Ferretti G, Dazzi M, Franchitto S, et al. Conjoined lumbosacral nerve roots: Observations on three cases and review of the literature. Neurocirugia (Astur) 2006;17:54-9. 17. Song SJ, Lee JW, Choi JY, Hong SH, Kim NR, Kim KJ, et al. Imaging features suggestive of a conjoined nerve root on routine axial MRI. Skeletal Radiol 2008;37:133-8. 18. Taghipour M, Razmkon A, Hosseini K. Conjoined lumbosacral nerve roots: Analysis of cases diagnosed intraoperatively. J Spinal Disord Tech 2009;22:413-6.